Here's my assessment of the beginner-potential for each of these pieces. The students can choose to make one of these designs (#1 would have to be simplified) or come up with something completely their own. Simplicity is key. #1 - Design too complex; cutting too precise. However, it illustrates different andamenti, nice texture, and could be simplified. #2 - Suitable for beginner. A beginner's would actually be better, I think, as it would be more loose and the lines would have more movement. (I tried to make the lines a little crooked, but mostly failed.) Nice variety of materials, plenty of straight cutting, no angles. Could easily be made more challenging. #3 - Suitable for an ambitious beginner. A little more demanding than #2 and #4, but still easier than it looks. The design/style is very forgiving and could allow for looser cuts. The surface texture is very dynamic. The porcelain outline of the half-circle and the 3 extended lines could be left out as they are not necessary. #4 - The most beginner-ish of the group. Easy to work in squares and let the widths of the material guide the interiors. Could easily up the challenge by making the geometric interiors more intricate. Really interesting geometric texture. My favorite of all four exercises, I believe that this is the most successful attempt to get close to a beginner's perspective. My cutting is loose and I worked rather freely. I started this going a different direction than where I ended up. Of course, I can't work like a beginner; that ship has sailed. But I was able to allow myself to let things go, to not focus on precise technique, to experiment — especially with this one, and to let go of the outcome. I tried to make a space to learn and to enjoy. I've never quite done anything like this one before, having the blues and yellows meet in this extreme zig-zag manner — and I think it works very well. I'm so pleased with myself to have tried something different, very different. Now, could a beginner really do something like this? I think so. Certainly, on a bit smaller scale. I was actually surprised by how fast it went and how forgiving it was. The blues are very nice mixed this way. I failed to capture it, but the blue glitter tile that I used has some pink/red sparks that show in certain light; the iridescent blue, as well, sometimes reflects pinks/purples, which I did capture some of on the full image. What an interesting couple of weeks or so. Starting out too complex and controlled, I made my way to a place which reflects the spirit of working like a beginner — or, at least, like a student. This was also an enjoyable exercise which has helped me appreciate my skill level, and the fact that there is plenty more to learn, and unlearn. I'm feeling prepared and excited for my class, and I'm happy to have four different examples for inspiration and instruction. I've also completely nailed down the materials, of which there is a good variety. I don't have much to say about this one, except that it was a fun, breezy few hours. I'm not usually into very high-contrast, like this blue with this yellow smalti, but this yellow is a little brighter than the one the class will be using. Still, I like the texture and I can imagine what a larger piece in this design would be like. For my 2nd attempt at getting into a beginner state of mind, l decided to simplify, stick with blues, and add a bit of gold in a rather wicky-wacky style. My cutting was much more loose and I actually tried to make the lines a bit crooked, although it barely shows. I think a beginner could definitely tackle something like this. Even with the whole smalti and half pieces of vitreous, there is plenty of demanding cutting for a novice to deal with. I actually think that, should a beginner take on this linear-textile-y kind of thing, it would turn out better than this one of mine, as it would probably be more loose, less straight, have more movement, and be much more charming. I'm sticking with this 10" x 8" size for my exercises to try to even out some of my experience advantage. This one went pretty fast and was quite enjoyable just working with those beautiful blues. Speaking of the blues, I used two different smalti blues in this one than I did in the first one. Although they are close, I prefer the blues in the first one. I've finished my 3rd one and will post it next. It's a geometric, repeating pattern design, and went very quickly. Again, fun to make. The 4th will not be linear or geometric, but rather something with some curves. Beginner's Mind #1. 10" x 8" | 25cm x 20cm. Smalti, vitreous, mosaic gold, marble, porcelain, other glass. This series is my attempt to work from a beginner state of mind. Initiated by a class that I am teaching, I wanted to have some examples for the students and wanted the examples to truly reflect something that they could achieve within the class hours. Focusing on texture, the students will create an 8" x 8" or 7" x 9" piece using a palette of blues and golds/yellows. The variety of materials will present a good challenge for a mostly beginner class. Note: I feel I must give a nod to Sonia King, as part of my inspiration for this class came from a piece I made, Remembering Istanbul, in her 2010 Istanbul workshop. While the design and textured execution were my own, she set the color palette and, of course, gave her expert guidance. My first attempt, shown above, turned out to be too complex for a beginner to create in the time period that we will have. I realized this about halfway through, but wanted to finish it anyway. It will still be instructional in illustrating ways to treat the various materials, and could be simplified. My second attempt, which I will post in the next few days, was more successful in that I am sure that a beginner could accomplish something similar, and I was able to work much, much more loosely than I did on the first. I must say, it was quite enjoyable. I am finding that it's a wonderful, although challenging, process to try to work in a beginner state. I am able to reflect on some things about myself, as an artist and mosaicist, through this foray into a beginner's mind, and I find that very exciting. I'll share some of those reflections when this little exercise is over. I plan to make at least four examples, and maybe six. The only downside is that I am going to have to order more materials as I am using them all up. But what fun! It's official! I'll be teaching a 6-week class on Monday evenings, Apr 6 - May 11, at WaterWorks Art Center in Tulsa. Light & Shadow: Textural Mosaic Art will teach basic mosaic construction while creating a 2-d mosaic art piece with a textural surface quality. 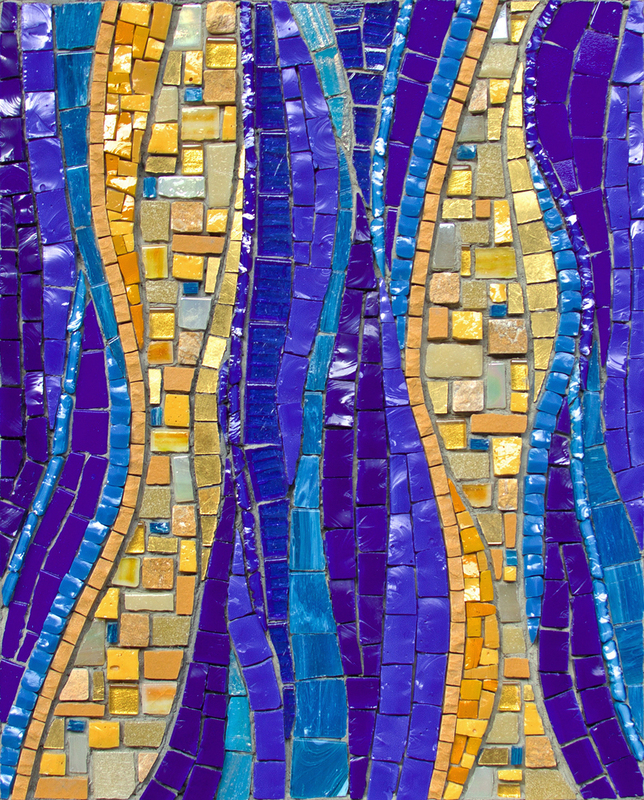 Students will learn to work with a variety of traditional and contemporary materials to explore aspects of light and shadow in a textured mosaic surface. I'm very excited about this class, and to be teaching at WaterWorks again. Find more information here.